Posted: Saturday, February 25, 2017. 11:27 am CST. By BBN Staff:Yesterday, the United States Embassy in Guatemala issued a statement asserting that the United States government will seek the extradition of former Guatemalan Vice President Roxana Baldetti and ex-Interior Minister Hector Mauricio Lopez Bonilla on drug trafficking charges. 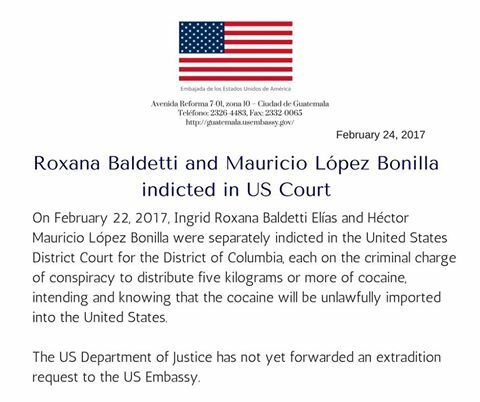 According to the statement, Baldetti and Lopez Bonilla were indicted in the U.S. District Court for the District of Columbia on Wednesday and each faces a charge of conspiracy to distribute cocaine and knowing that it would be imported to the United States. Gustavo Juarez, Baldetti’s attorney told the media that they had not been notified of the U.S. allegations. “The legal process is that she finishes her cases in Guatemala and later if approved she is extradited, even though she could also decide to be extradited and not fight it,” Juarez said. Juarez further added that he would immediately visit Baldetti in prison to advise her of the new charges. 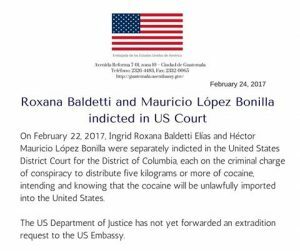 According to the indictment, Baldetti and others conspired between 2010 and 2015 to import cocaine to the U.S. The US Embassy is currently waiting for the formal extradition request from the U.S. Justice Department. Both Baldetti and Lopez Bonilla served in the administration of ex-President Otto Perez Molina who held office from 2012 to his resignation in 2015. In 2015, Baldetti resigned as well and in 2016 was charged for corruption. According to news reports, she has been in custody on charges of allowing and benefiting from an alleged customs graft scheme that defrauded the country of millions of dollars. Perez Molina has also remains in custody.